One part of biology that fascinates me is the three-dimensional structure of genomes and all that goes with them within the nucleus, the central organelle in our cells containing our genomes and the molecular machinery that organises, moves and processes our genetic information. 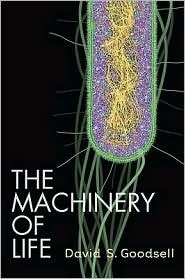 In the TED lecture below Drew Berry speaking in Sydney, Australia, shows off animations of molecular life. 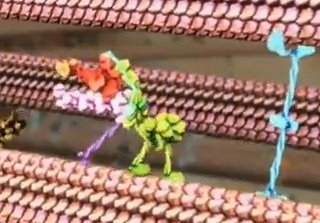 The animations he shows are of DNA, chromosomes and the proteins that work with them. Let me add a few scraps. I would add a whole lot explaining each of the different systems he shows, but they’d each be very long articles. So let’s make do with scraps. A point about molecules being smaller than a wavelength of light is that a light microscope cannot ‘see’ things smaller than the wavelength of light. Early-ish in the piece he shows a still illustration (below) by David Goodsell, who has an excellent book of these, The Machinery of Life. ** Note the density of molecules. Life isn’t a few bits swimming around in water. There’s lots of molecules, all jostling together. Sufficient to say here that it’s impressive what molecules can do, all evolved from the basic chemistry and physics of the molecules. There’s a part of me that looks at this and thinks this would be truly fun. Why? Not just the ‘pretty pictures’, but because it blends a lot things I’ve enjoyed. My original high school orientation was actually strongly towards art, not science – that came later. I’ve worked on molecular simulation, if you like a more formal sort of animation used to explore how molecules behave. I’ve long been interested in how the larger complexes form together the biophysical nature of what goes on in life – it’s what got me into my field in fact. I can recall first learning about how molecules really worked and realising there was a ‘hidden’ layer of life beyond what microscopes can see – the sort of thing that these animations visualise. My earlier research was in proteins that interact with DNA. And, of course, I’ve ‘fooled around’ programming and using computers since the mid 1980s. I guess some would have graphics work on Lord of the Rings, others visualising life on small scale. * Scientists would more accurately say our chromosomes or chromatin – it’s also the proteins that are part of chromosomes and the proteins and RNAs that works with the DNA to process or transform it. ** I haven’t seen a copy, but I have seen many example of the illustrations and pages online.